Many years ago, my friend Catherine had a neighbor with a persimmon tree. Every year during the fall, I would return home from a visit with a bag of ripening persimmons. 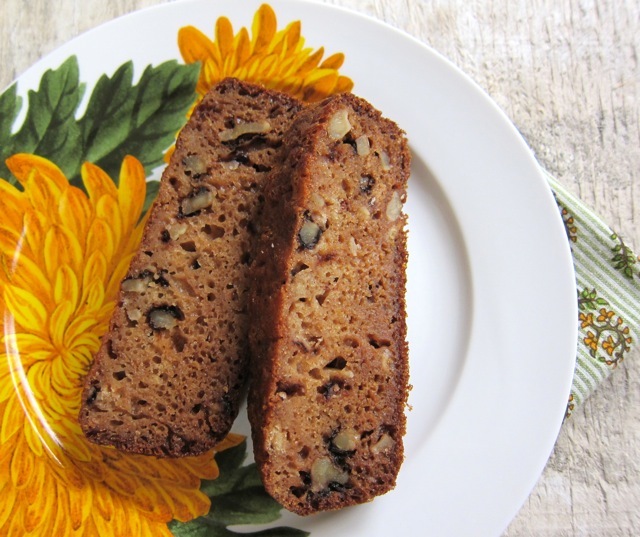 Cathy passed along a version of this recipe for Persimmon Pudding, a dense bread rich with spice and fruit, more aptly named a “pudding”. You will need very ripe fruit here. 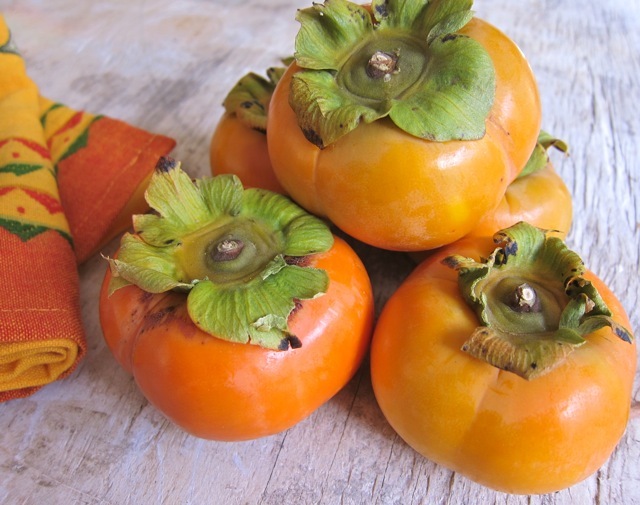 I have always used “Hachiya” persimmons, the apple-shaped ones that gets soft and custard-y when it ripens. Mine took two weeks to fully ripen, something to keep in mind if you are planning to bake for a specific occasion. This is a very flexible recipe that allows you to play with favorite spices. I used walnut oil because I had some on hand and thought it would pair well with the walnuts. Canola or grapeseed oil work equally well. Pecans are nice here too. TIP: This bread freezes beautifully. 2. Combine the persimmon puree with the baking soda and set aside. 3. Using a large bowl, mix together the sugar, flour, salt, cinnamon and ginger. 4. Beat the eggs slightly, stir in the milk and add to dry ingredients. 5. Add the persimmon-soda mixture, plus the vanilla, lemon zest, oil and nuts. Mix well. 6. Turn the batter into a loaf pan with has been lined with greased parchment paper. 7. Bake for 1 hours. Allow bread to rest for 15 minutes before turning onto a rack to cool. I’m learning to love persimmons here in CA. This recipe sounds like a great way to put them to use. Finding a friend or generous neighbor with a tree insures your will have a chance for ripe fruit. Been there, Wendy – thanks and see you on Friday at IFBC! I waited weeks for mine to ripen, to tell the truth. Rachell, this is my dream, to have “no-foodie” pals commenting on my blog.Thank you so much – I’m just home from a huge food-bloggers conference. See you at yoga Monday! Silvio, my kitchen prep man brought me TWO gorgeous persimmons (Extremely Ripe) yesterday and I thought of your recipe immediately. I pureed the persimmons with skin and seeds (for fiber) in the Vitamix and sub’d Canola Oil for the Walnut Oil as I did not have any in the pantry. I baked mine at 310 for 1 hour and 10 minutes. The color is much darker then yours, but it is so rich and moist, really, really so good Liz! It is a true pudding spoon bread, I really love it. Yes, yours clearly turned out better than mine, as mine were not as ripe as I needed – so pleased!